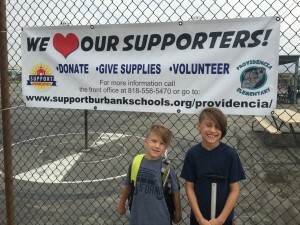 Burbank Business Partners strives to raise awareness and focus the energy and talents of our parents and community to raise funds and or collect materials to support a variety of school programs and services that may be at risk due to limited school funding. Any and all contributions are critical to this effort, but to make it happen we first need to take action. From parents and neighbors to merchants, everybody has something to give, whether it’s funds, school supplies, equipment, or simply the time and passion to see our schools succeed and flourish. It all starts with you, the Burbank community, so find out how and where you can help, and make a difference today. Click here to visit the SuportBurbankSchools.org website or locate the school nearest you using the map below. Click on the School Houses for each school’s contact information and website address.